Warming Up Into The 70's Today...Big Storm Late Week. 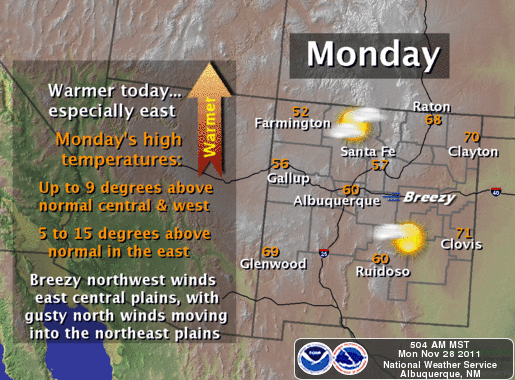 Sunny skies and much warmer temperatures will be our weather story for the day. 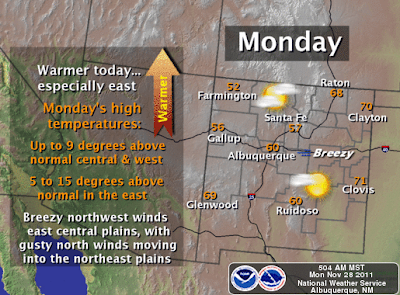 Most of SE NM should climb up into the low-mid 70's this afternoon. Today will likely be the warmest day that we see over the next week...its going to be awhile before we see the mid 70's again after today. 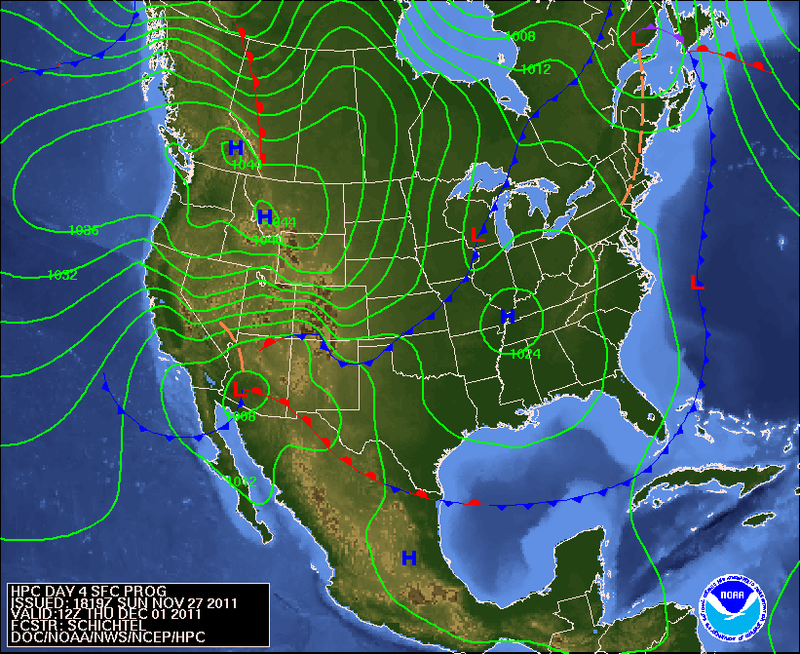 Cold Front Arrives Late Tonight. Surface Forecast Map Valid At 11 PM MST Tonight. A cold front will arrive in SE NM late tonight. 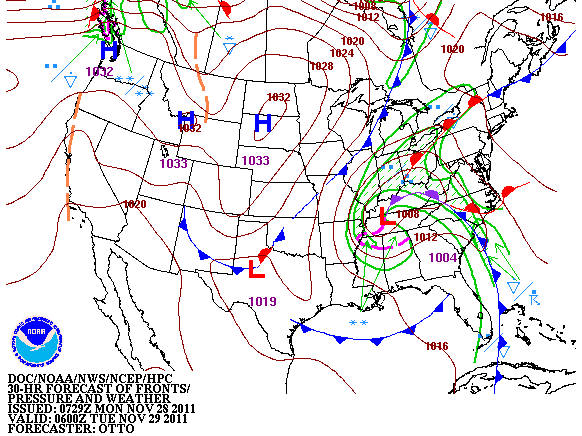 This will be the first cold front to affect our local weather, with a much stronger cold front arriving on Thursday. This second cold front will bring cold arctic air to the region. Our high temps are forecast to only be in the low-mid 50's tomorrow, and the mid 60's on Wednesday. Strong Storm In The Mid-Upper Levels Of The Atmosphere. 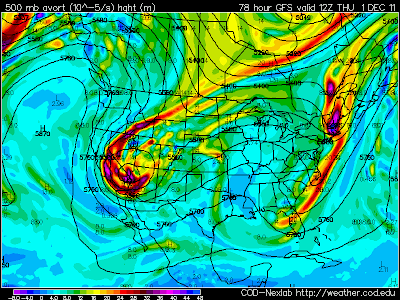 Valid At 5 AM MST Thursday. 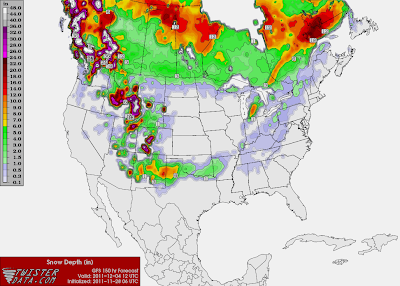 For a week now, the US GFS forecast model has been indicating that a strong cutoff upper-level storm will dive southward out of the Pacific Northwest, and into the Desert Southwest by the end of the week. This is the easy part of this weeks weather forecast. The models continue to struggle with what happens with this storm after Thursday. 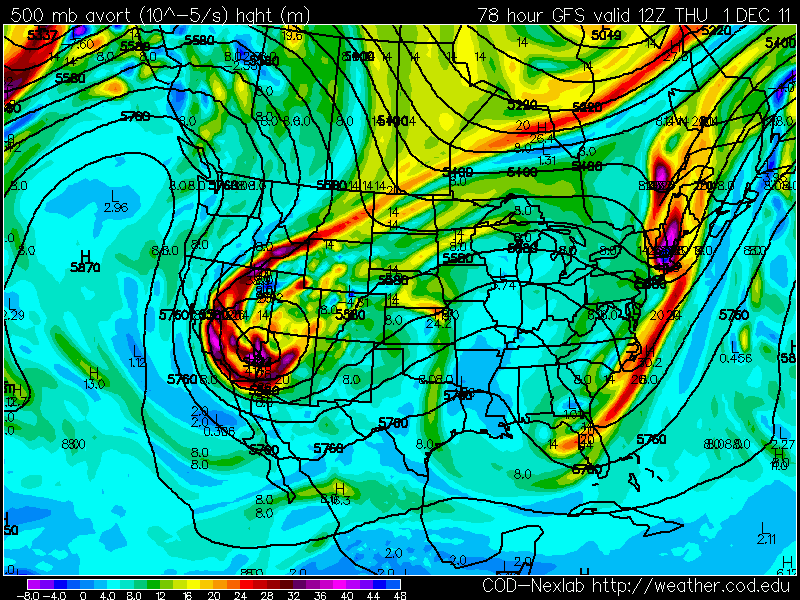 The GFS continues to deepen the storm, as well as digging it a little further south with time. It also wants to slow the storms eastward progression down, not clearing the state until possibly as late as Sunday. It wants to keep the mid-upper level low as a cutoff low until it crosses over southern New Mexico this weekend, then begins to open the storm up, while weakening it as it moves into West Texas by late Sunday. Meanwhile the European (ECMWF), and the Canadian (CMC) models, open the mid-upper level low up, and move it across the state in a faster and weaker mode by Saturday. This is nothing new, the models typically struggle with cutoff upper level lows. And given the fact that the blocking pattern that has been prevalent this fall, is showing signs of breaking down, just further complicates the forecasts. 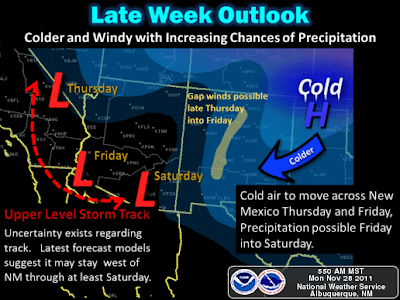 Cold Arctic Air May Stick Around For Awhile. 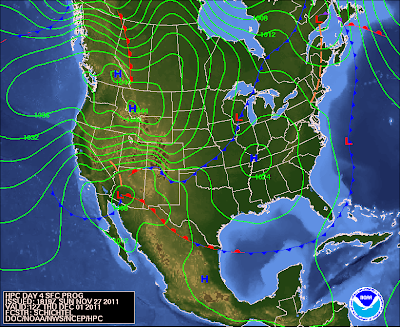 Surface Map Forecast Valid At 5 AM MST Thursday. 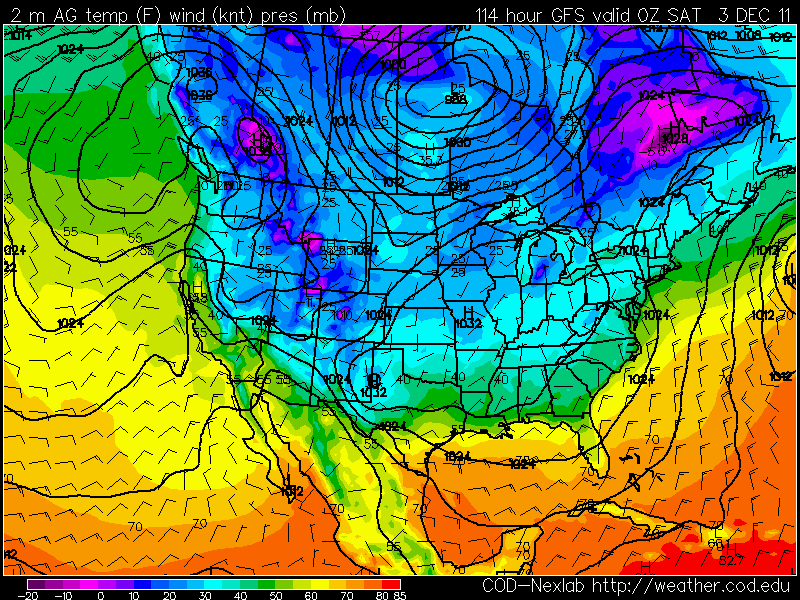 GFS Surface Temperature Forecast At 5 PM MST Friday. 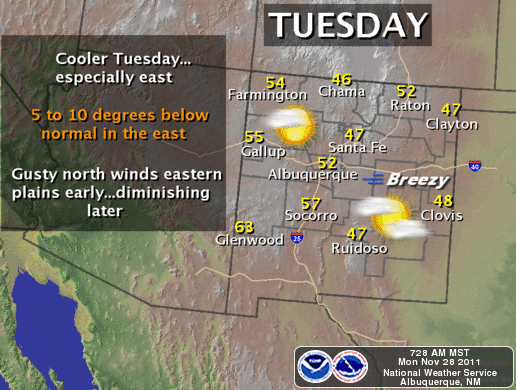 A cold dome of arctic air will arrive in SE NM sometime on Thursday. If the cold front arrives early enough Thursday morning, our daytime high temps will be colder than forecast. Likewise, if it is a little slower in getting here, then our highs will be warmer than current forecasts indicate. Typically the models also struggle with the arrival times of these arctic fronts. Either way it appears that we are headed for colder temperatures. 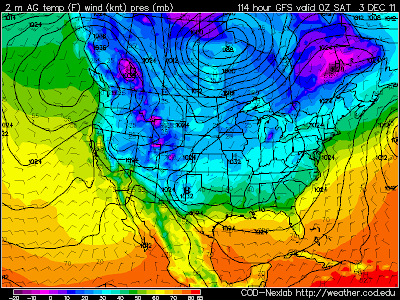 There is the possibility that cold air could get entrenched over the area from Thursday into the first of next week. Just how cold it will get is the question. For now it appears that we are looking at daytime high temperatures of at least in the 30's and 40's, if not colder. If we get enough snow on the ground then our nighttime lows during this period could be really interesting too. Will It Snow...And How Much If It Does? GFS Snow Depth Forecast At 5 AM Sunday. 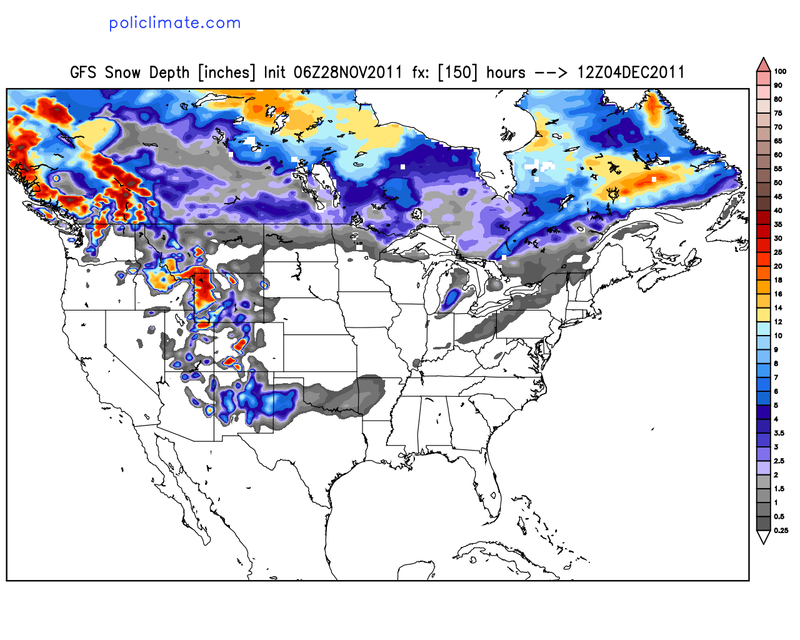 GFS Snow Depth Forecast At 5 AM MST Sunday. Now the hard part of this discussion. Will it snow in SE NM and nearby areas? The safe answer at this time is the easy one, maybe. This is going to be a complicated storm to deal with to say the least. Everything depends upon how far south the upper-level digs, how fast to the east that it moves and when, as well as how much low-level upslope flow gets ingested into the storm, and how cold will the arctic airmass be and for how long. My thinking for now is that this is going to be a messy storm so to speak. A pocket of warm air at around the 850-700 millibar level, or 5,000 to 10,000' MSL, may get pulled over the top of the arctic air at the surface Friday and Saturday. This could really complicate the forecast. For one, it could help to modify the arctic air to where it would not be as cold as some of the models are forecasting. It could also help produce a mixed bag of precipitation across the area. We could see a combination of drizzle, rain, freezing rain, sleet, and snow. As always when trying to forecast our local weather the devil is in the details. Its just too early yet to try and call this one. There is the potential for snow across the area, and some of the mountains of the state could get hammered with heavy snow. If the upper-level storm opens up and moves eastward faster than the models indicate, then we would more than likely just get some colder weather and wind. More on this potentially significant winter storm later.